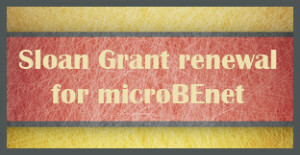 Just got the good news that microBEnet will continue to be funded by the Sloan Program in the Microbiology of the Built Environment for the next two years. After three years of attempting to help the field with “curation, communication, collaboration, connection” we have taken this as an opportunity to re-assess our direction and goals. We solicited feedback from the community on things to change and also got great feedback from our (8!) grant reviewers. In the interest of transparency, I thought it might be useful to share some snippets of our grant and parts of our response to reviewers to give members of the community a sense of where we’re headed in the next couple of years. Ongoing feedback is more than welcome! Among the key recommendations were: (1) more hosting of resources that others have that could be useful to share (e.g., reference collections, data sets, software tools, etc), (2) more guest blog posts, more discussion of recent papers, (3) more targeted workshops to develop interactions among people, (4) more involvement of undergraduates in microbiology of the built environment activities, and (5) more outreach at the K-12 level and public level. Our main proposed activities are in the following six general areas (1) curation and creation of resources, (2) meetings and workshops, (3) longevity and sustainability, (4) teaching and spreading openness, (5) leveraging social media, and (6) research, education and outreach. As part of another project at UC Davis we have been interacting with an excellent assessment group from the UC Davis school of education. We propose to contract them for carrying out some assessments of the project. Furthermore we propose the creation of a microBEnet advisory board made up of key members of the community and knowledgeable outsiders. Assessments and metrics will be presented to the AB for feedback annually. We propose the addition of Shelly Miller from CU Boulder to our project. Dr. Miller is an Associate Professor of Mechanical Engineering at the University of Colorado Boulder. She is also a faculty member of the interdisciplinary Environmental Engineering Program at CU (more information is here http://shellym80304.wordpress.com). Her research covers topics at the interface of microbiology and building science and she is currently part of one of the Sloan Foundation funded projects in microbiology of the built environment. We propose to develop a new course on microbiology of the built environment jointly with Dr. Shelly Miller which will be a fully integrated building science & microbiology course. In addition we propose to develop the course in such a way that it could be easily copied or modified by others – with online resources and course materials. A planned revamp of the website and “branding” is already underway and will hopefully be deployed before the end of the year. The majority of site traffic is from organic search traffic and arrives on only a few pages, these pages will be the focus of our initial efforts. A number of reviewers emphasized the importance of our proposal to collect and distribute protocols. We are pleased this is considered important though we perhaps did not realize how desirable this would be. We therefore propose to increase our focus on this in response to the reviews and specifically propose three main activities in this area. First, we propose a traditional collection of written protocols hosted on the website. This is perhaps trivial from a technical perspective but in practice it is challenging. For example, in the past we have requested such information from Sloan funded researchers but have not had much response. But we will be more aggressive about obtaining such protocols. Second, we propose that to help in providing a “carrot” for people to participate, we will offer detailed instructions (and personal guidance if needed) to show researchers how they can get citable publications out of methods and protocols (e.g., by posting to Figshare, or arXiv). Third we propose an expansion of the Google Hangouts approach we have used in the past year (organized by researchers at Berkeley and Oregon). In these (recorded and posted to microBEnet) sessions, researchers discussed various protocols and methods. Watching a 30 minute video of this nature could save a new lab many many man-hours of trial and error. We would like to organized and host a number of these sessions in the coming two years and make sure that they are publicized both within and outside the Sloan community.